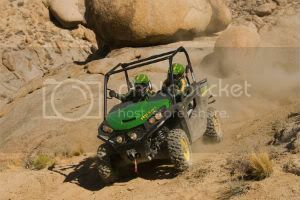 The newly released John Deere Gator RSX850i has emerged into the sports/utility UTV market with a splash, according to a FourWheeler.com review, due to its unique blend of sleek design, power and agility that has impressed riders. This new vehicle is available in three trim levels: base, sport, and trail. The sport series is more geared for high-speed experience through desert environments and features alloy wheels, Maxxis tires, PreRunner bumper, cargo box rails, sport steering, and Fox 2.0 Performance Series shocks. The trail model, which is geared toward hunters and fisherman, adds sports seats to the equation, with allow wheels, Maxxis tires, Warn winch, front brushguard, 2-inch front receiver, rear bumper, and cargo box rails. According to the review, “Living up to its aggressive body styling, the Gator RSX850i uses an all-new chassis that was designed from the ground up to tackle the harshest terrains, while providing exceptional comfort and a high level of performance to its riders.” The vehicle is propelled by a 62hp 839cc, V-twin engine that reaches 30 mph in just three seconds with a top speed of more than 53 mph. Sports/utility UTV riders now have the opportunity to operate a Deere product that competes with the best vehicles on the market, according to early reviews. The design, workability, and power create a unique blend that will enhance the riding experience for all users.